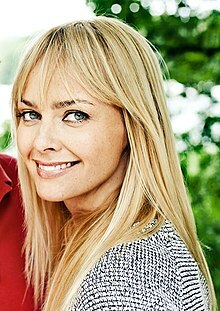 Izabella Scorupco (born Izabela Dorota Skorupko; 4 June 1970) is a Polish-Swedish actress, singer and model. She is perhaps best known for having played Bond girl Natalya Simonova in the 1995 James Bond film GoldenEye. Wikimedia Commons has media related to Izabella Scorupco. Scorupco was born to Lech, a musician, and Magdalena Skorupko, a doctor, in Białystok, Polish People's Republic, in 1970. When she was one year old, her parents separated, and she remained with her mother. In 1978, they moved to Bredäng in Stockholm, Sweden, where Scorupco learned to speak Swedish, English and French. In the late 1980s, Scorupco travelled throughout Europe working as a model, and appeared on the cover of Vogue. In 1987, she was discovered by director Staffan Hildebrand and starred in the film Ingen kan älska som vi ("Nobody can love like us"). In the early 1990s, she had a brief but successful career as a pop singer, releasing the album IZA, which was certified gold in Sweden in 1991. On 25 December 1996, Scorupco married Polish ice hockey player Mariusz Czerkawski. They had one daughter together, Julia (born 15 September 1997). They divorced in 1998. On 30 January 2003, Scorupco married an American, Jeffrey Raymond; they have a son, Jakob (born 24 July 2003). They divorced in 2015. She now lives in Los Angeles and New York City. In 2011, Scorupco reprised her singing career, duetting with Swedish musician Peter Jöback in his single Jag Har Dig Nu and featuring in the song's music video. She also starred in Jöback's short extension film La vie, L'amour, La mort. Scorupco went on to host the spring 2012 series of Sweden's Next Top Model but did not continue it for a second series. Scorupco moved into the comedy world in July 2013 when she was named to a lead role in a new Swedish romantic comedy, Micke & Veronica, alongside David Hellenius. It premiered on 25 December 2014. 2005 Alias Sabina TV series, Season 4, Episode 15: "Pandora"
"I Write You a Love Song"
^ Fashion Model Directory profile. Retrieved April 15, 2012. ^ Profile/Biography of Izabella Scorupco Archived July 16, 2011, at the Wayback Machine. StarsHub.com. Retrieved January 25, 2010. ^ Izabella Scorupco: Bond girl (GoldenEye). Nordic Reach. Retrieved January 25, 2010. ^ "Peter Jöback & Izabella Scorupco: 'Jag Har Dig Nu' » Scandipop.co.uk". September 27, 2011. ^ "Izabella Scorupco Hosts Top Model Sweden". JamesBond007.se. January 6, 2012. Retrieved February 14, 2012. ^ a b Hung, Steffen. "Discography Izabella". Swedish Charts Portal. Hung Medien (Steffen Hung). Retrieved October 12, 2014. ^ Hung, Steffen. "Discographie Izabella" (in German). Austrian Charts Portal. Hung Medien (Steffen Hung). Retrieved October 12, 2014. ^ Hung, Steffen. "Discografie Izabella" (in Dutch). Belgian Charts Portal. Hung Medien (Steffen Hung). Retrieved October 12, 2014. ^ "Discographie Izabella" (in German). Media Control. Retrieved October 12, 2014. ^ Hung, Steffen. "Discografie Izabella" (in Dutch). Dutch Charts Portal. Hung Medien (Steffen Hung). Retrieved October 12, 2014. ^ Hung, Steffen. "Discography Izabella". Norwegian Charts Portal. Hung Medien (Steffen Hung). Retrieved October 12, 2014. ^ Hung, Steffen. "Izabella - Shame, Shame, Shame" (in German). Swiss Charts Portal. Hung Medien (Steffen Hung). Retrieved October 12, 2014.